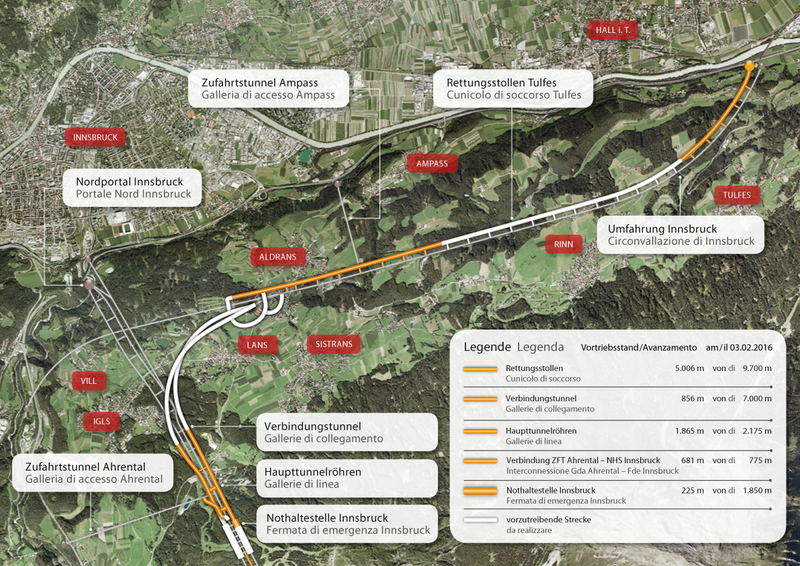 Just over half (about 5 km) of the 9.7 km Tulfes/Ampass emergency tunnel has already been excavated. On February 6th 2016 a new set of works that include the overpass of the two tubes that make up the Inn Valley tunnel has begun. These works require the Inn Valley tunnel to be completely closed to rail traffic on every weekend in February and March. On February 6th, 2016, new works on the Tulfes/Ampass emergency tunnel were begun. These works include the overpass of the Inn Valley railway tunnel. Since these excavations will be carried out directly above the Inn Valley tunnel with a limited overburden between the two structures, special precautions must be taken for the work. 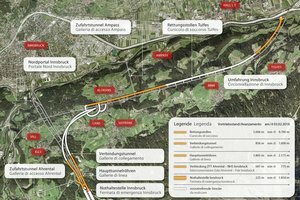 The Inn valley tunnel will be closed to rail traffic during the works; trains will be re-routed through Innsbruck. The ÖBB has announced that the tunnel will be closed from 8 AM on Saturdays to 5 PM on Mondays from the beginning of February to the end of March. Each weekend, there are eight windows for the excavation works on the Brenner Base tunnel that include blasting work. Achieving the planned 30 meters of excavation requires very accurate planning and very hard work. The individual work phases are organized in such a way as to avoid, as much as possible, the carrying out of noisier construction activities (such as drilling for anchor bolts) during the night-time. These cannot be completely ruled out, however, as certain activities are required for the geotechnical consolidation of the excavation. During the week, excavation works continue towards the „Vogelhütte“ restaurant. No construction work will take place over the Easter weekend. After April 4th, excavation will continue below the western edge of the village of Aldrans. The stretch to the Vogelhütte should be finished by then. BBT SE apologizes for any inconvenience that may result from the construction work. We will do our utmost to complete the works quickly and efficiently and to keep any disturbance to a minimum.